"Johnny Bower was a legend. He was a Stanley Cup champion. He had a wicked poke check. And he was beloved, not just by fans of the Toronto Maple Leafs, but by hockey fans everywhere." 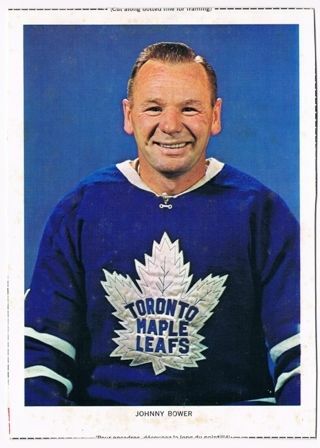 "Johnny Bower was the best standup goaltender I'd ever seen, even better than Turk Broda. He played his angles better than anybody else. he stood on his feet better than anybody else, and he stopped the puck very, very well." "There may not be a more loved Toronto Maple Leaf nor a former player who loved them back as much . . . Johnny was beloved much more than his Hall of Fame credentials as a player. It was his generosity of spirit, kindness and passion for people that made him a legend at life." When I learned that Johnny Bower had passed away at the age of 93, I felt as if I had lost a part of my childhood. No doubt, many baby boomers in the Toronto area and elsewhere felt the same way. Johnny was a Hall of Fame goaltender who played on four Stanley Cup teams for the Maple Leafs. However, as Brendan Shanahan pointed out, he was much more than a great goalie. He was a great person. Johnny was not arrogant or extremely wealthy. He simply conducted himself with the utmost class and dignity. He was a true gentleman in every sense of the word. I have never heard anyone say a bad word about him. He was a great ambassador for the Maple Leafs,. always signing autographs and chatting with fans. Johnny Bower was born John William Kiszkan in Prince Albert, Saskatchewan, a farming town north of Saskatoon.on November 8, 1924. He was one of the nine children of John Kiszkan, a labourer at a Prince Albert packing company, and his wife Betty. Johnny and his siblings (one brother and seven sisters) grew up on the Prairies during the Great Depression. He and his friends played shinny on rivers, lakes and patches of ice during the cold Saskatchewan winters. The Kiszkan family couldn't afford hockey equipment, so Johnny's father designed his son's first hockey stick from poplar tree branches. Pucks were made from pieces of wood, rolled up in black tape and Johnny's first goalie pads consisted of mattresses cut in half. As a child, Johnny wasn't a good skater and he preferred to be a goaltender. "I used to watch the defencemen and forwards get bounced," he told hockey writer Stan Fischler. "I figured, heck, I got it better than they do. At least I'm still standing on my feet." At the age of 15, Johnny lied about his age and enlisted in the Canadian Army during World War II. He reported to Vernon, British Columbia for training and from 1940 to 1943, he was stationed in England as a gunner with the 2nd Canadian Division. Due to rheumatoid arthritis, he was discharged from military service. Upon his return to Prince Albert, he played junior hockey with the Prince Albert Black Hawks of the Saskatchewan Junior Hockey League in 1944-45. It was there that he caught the attention of the Cleveland Barons of the American Hockey League (AHL). Johnny received a call from Hub Wilson, general manager of the Barons, Hub persuaded him to leave Prince Albert and his part-time job with CN Rail and move to Cleveland, Ohio. At the start of the (1945-46) season, Johnny turned professional. He signed with the Barons for a $50 bonus and $1,700 for the season. Under Cleveland coach Bun Cook, a former forward for the New York Rangers, Johnny made improvements to his game. Cook taught him how to play the angles rather than throw himself at shots. Johnny also began using lighter sticks to lessen the effects of the arthritis which had weakened his hands. By the 1949-50 season, he was the ace goalie for the Barons. After Johnny's parents divorced in 1946, Johnny began using the surname "Bower," his mother's maiden name. During his his first year of professional hockey, he legally changed his last name to "Bower," stating that he did so because sportswriters had difficulty spelling "Kiszkan" correctly. 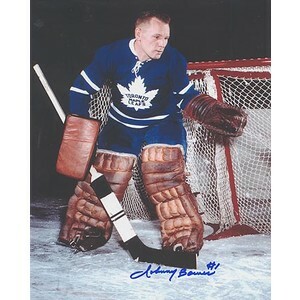 Johnny Bower was a star goaltender in the AHL and was voted the league's best goalie three times. However, he didn't catch on in the National Hockey League until he was in his 30s. In fact, he spent almost 12 years in the minors, mostly with Cleveland, before landing with the Toronto Maple Leafs. In November of 1948, Johnny married a Saskatoon woman named Nancy. 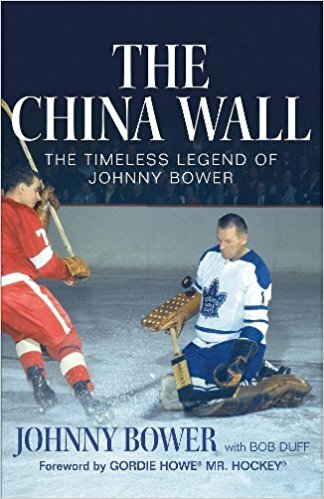 In his book, The China Wall: The Timeless Legend of Johnny Bower, Johnny describes how he met his future wife on a golf course north of his hometown of Prince Albert. It was the summer of 1948 and Johnny's Cleveland Barons had won the Calder Cup (the championship of the American Hockey League). Johnny, who was working as an assistant pro that summer, was sent out to warn Nancy and her friends not to swing their golf clubs so wildly. Although Nancy was angry about the incident, she still agreed to go to a movie with Johnny when they ran into each other in town that evening.. Although Johnny will forever be associated with the Blue and White of the Toronto Maple Leafs, he did suit up for another NHL team. He was picked up by the New York Rangers for the 1953-54 season. They chose him as their starting goalie over Lorne "Gump" Worsley, the previous year's winner of the Calder Memorial Trophy as the NHL's rookie of the year. Bower played all 70 games for the Rangers that season. Still, the following season he was sent back to the minors in favour of Worsley. Johnny played for the Vancouver Canucks of the AHL (1954-55), the Providence Reds (1955-56) (1956-57) and the Cleveland Barons. (1957-58), Then along came the opportunity of a a lifetime,, which Johnny almost turned down. The last-place Toronto Maple Leafs were looking for an upgrade in goal. On June 3rd, 1958, they claimed Bower from the Cleveland Barons in the Inter-League Draft. Johnny, however, was reluctant to join the Maple Leafs. He was tired of moving around and his intention was to remain with the Cleveland Barons. He was content in Cleveland and even had a successful restaurant in the city, Ultimately, though, he couldn't resist a chance to realize his dream of winning a Stanley Cup. Some persuasion from his wife Nancy also helped him to make the decision to play for the Leafs. In 2017, Johnny told the Toronto Sun that "Nancy always reminds me I didn't want to go. I said at the time, I'm 33, I'm happy in Cleveland. She kept saying this is your big chance. We wound up staying for four Cups." In July of 1958, the Leafs hired George "Punch" Imlach to be an assistant general manager (in November he was named full-time general manager, after which he also appointed himself head coach). Imlach strongly encouraged Johnny to play for the Leafs. He finally agreed and became an integral part of a golden era in the history of the storied franchise. Johnny Bower had his name inscribed on the Stanley Cups four times during the 1960s. The Toronto Maple Leafs enjoyed three consecutive victories in the early years of that decade (1961-62) (1962-63) (1963-64) and then 1966-67. Johnny won the Vezina Trophy two times during his career with the Leafs - in 1961 and 1965. He shared the 1965 award with teammate and fellowHall of Famer Terry Sawchuck (Note: Until the 1981-82 season, the Vezina was awarded to the goalkeeper(s) of the team allowing the fewest number of goals during the regular season. It is now given to the goalkeeper who is judged to be the best at his position by the general managers of all NHL clubs). 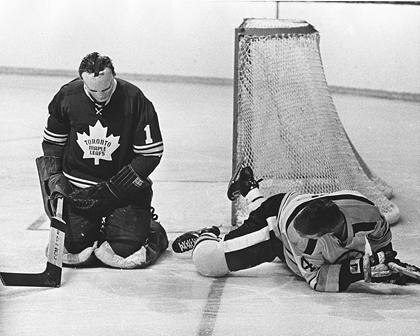 The goaltending tandem of Bower, 42 and Sawchuck, 37, led the Toronto Maple Leafs to an upset victory in the 1967 Stanley Cup Final over the Montreal Canadiens. The Leafs defeated the Canadiens four games to two. In doing so, they captured the thirteenth Stanley Cup in franchise history. The NHL underwent an expansion for the 1967-68 season, with the number of teams doubling from six to 12. The Maple Leafs lost Terry Sawchuck to the Los Angeles Kings in the expansion draft. and they have not won another Stanley Cup to date. The 1968-69 season was Johnny Bower's last full season in the NHL. On April 6, 1969, at the age of 44 years, four months, he became the oldest goalie to play in a Stanley Cup playoff game. Johnny appeared in one game for the Toronto Maple Leafs during the 1969-70 season, mainly due to injuries. He played his final NHL game on December 10, 1969, a 6-3 loss to the Montreal Canadiens at the Montreal Forum. In March of 1970, Bower announced his retirement. He was 45 years old and had played 11 complete seasons with the Maple Leafs. Johnny Bower died of pneumonia on December 26, 2017. 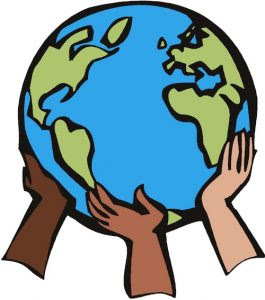 He is survived by his wife of 69 years, Nancy, and their three children, John Jr., Cindy and Barbara, plus eight grandchildren and six great-grandchildren. He will be remembered for his fierce determination on the ice and his charitable works off the ice. I regret that I never had the opportunity to meet him or speak to him. I also regret that h won't be here to see the Leafs win the Stanley Cup again, whenever that may be (soon I hope). However, I know he will be here in spirit to enjoy it. 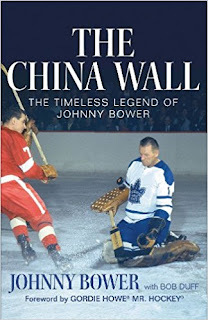 * Johnny Bower's nickname was "The China Wall" because of his solid, tough-as-nails, brick-wall-like goaltending. He was given the nickname by a Cleveland sportswriter during minor league career. The "China Wall" moniker was also a reference to Johnny's age. He was teased about being as old as the Great Wall of China. * Not only was Johnny suffer from arthritis, but he also had poor eyesight. * On November 9, 1965, Johnny, his son, John Jr. and some neighbourhood children, recorded a novelty Christmas song called "Honky the Christmas Goose." The children's song, written by CBC producer Chip Young, told the story of a wild goose that ate so much he couldn't fly, but ultimately is able to save Santa Claus. 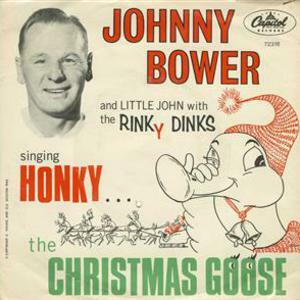 "Honky the Christmas Goose" by Johnny Bower and Little John with the Rinky Dinkss became a local hit. It was played on CHUM 1050, a popular Top 40 Toronto radio station. In December of 1965 It reached No. 29 on the CHUM Chart, dislodging The Beatles' "Day Tripper." * Johnny's oldest appearance in the NHL took place 32 days after his 45th birthday, on December 10, 1969). He was the first player in NHL history eligible to collect his pension while still on the active roster. To date, the oldest goalie to ever play in an NHL game is Maurice "Moe" Roberts (born December 13, 1905).. Moe Roberts, an American hockey player, appeared in a game for the Chicago Black Hawks on November 25, 1951. Roberts was the assistant trainer for the Black Hawks and was called on to substitute for the injured regular goaltender Harry Lumley (backup goalies were not used in those days). He didn't allow a goal, but the Hawks still lost the game to the Detroit Red Wings by a score of 5-2. Roberts was 45 years, 11 months and 13 days old when he played that game. He appeared in a total of only ten NHL games (with the Boston Bruins, New York Americans and Chicago Black Hawks). * Johnny was inducted into the Hockey Hall of Fame in 1976. * Johnny resided in the Toronto suburb of Mississauga, Ontario. * In September of 2014, Johnny Bower and two other players were officially honoured with a bronze statue of themselves on "Legend's Row" outside of Toronto's Air Canada Centre. Johnny and fellow Leaf greats, Ted Kennedy and Darryl Sittler, became the first three members of "Legend's Row." * On January 1, 2017, Johnny was named one of the hundred greatest players in the NHL's first century. The ceremony took place at the 2017 Scotiabank Centennial Classic in Toronto.